Combine the chili powder, garlic powder, onion powder, red pepper flakes, oregano, paprika, cumin, salt and pepper in a dish and stir together to make your own taco seasoning. Set aside. Bring a large nonstick skillet over medium heat and add the ground beef. Cook while breaking up with a wooden spoon until beef is completely browned and broken into small pieces. Drain any grease from the pan. Add the taco seasoning from step 2 and the salsa and stir together until well combined. Transfer the mixture to a mixing bowl and add the shredded cheese. Stir to combine. Place about half the tortillas between two paper towels and microwave them for 30-60 seconds until they are warm and pliable. Place a tortilla on a clean, dry work surface and then scoop two rounded tablespoons of beef filling onto the bottom third of the tortilla. Roll the tortilla up from the bottom to surround the filling and once it’s rolled into a tube, place it on the prepared baking sheet, seam side down. Repeat steps with the remaining ingredients (including microwaving the other half of the tortillas when you get to them). 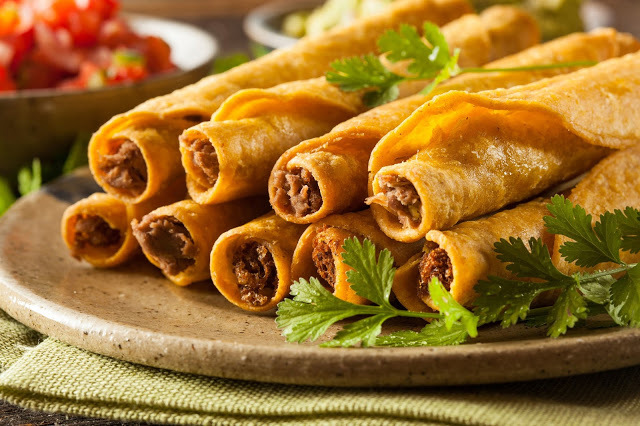 When all the taquitos are rolled and on the baking sheet, mist the tops of the taquitos with cooking spray.